Bob Aston – Narooma Rotary Club Inc.
Hello, Rod’s Ramble comes from the Nation’s capital today. I am in Canberra for a week working. Hopefully Laurelle will be in the chair for this week’s meeting. Welcome back Laurelle, look forward to hearing about you travels soon. I understand Angie is also back tonight, welcome home Angie. Over the weekend I attended my high school 50th year reunion along with our own Peter Bull and friend John Brown. 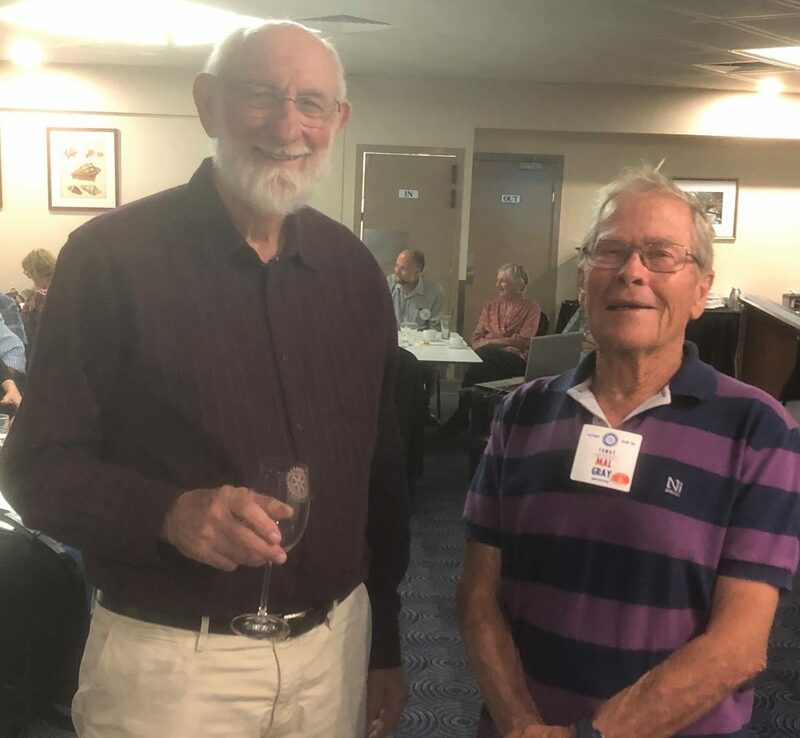 Yes, we went to the same high school Sydney Boys High and finished year 12 in the same year 1968. It was great to catch up with friends not seen for 50 years and not recognised thank heavens for name badges. Lots of tall stories were told and teachers bagged. I also found out that Peter Bull started his career as a larrikin 50+ years ago. Sunday’s market had a good vibe at least while I was there until 10.30. The volunteering expo was going well with lots of exhibitors and interest from market goers. Thanks to Chris for wrangling all the exhibitors and Charmaine for organising the volunteer event. We will do a debrief with the exhibitors and decide if we might make it an annual event. As I said at the meeting we are still searching for a President for 2018-19. The AGM is only 6 weeks away and the President Elect should be in place before then. Why – so that the incoming President can have some influence over who is on their Board. Not sure what happens if we don’t get someone, probably means our 60th year is our last year. 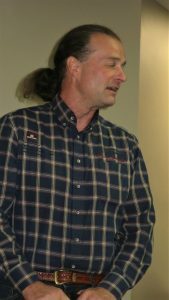 At this week’s meeting the recently formed membership committee is going to lead a discussion on their deliberations to date. I what to encourage everyone to participate. I just wanted to thank you for all of your support and help with the Expo last Saturday. I suspect that without you we would not have had such a success with 10 exhibitors plus the Tesla – and then approx. 250 through the door. While the numbers do not match those that you have had for the past two years – I was extremely pleased and consider the Expo a success. I have had positive feedback from some of the exhibitors and believe that most if not all will participate next year in Narooma. Not much to report. I have moved the Board meeting to this Thursday 4th at 5:00pm as I will be away again the following week. That will make this week’s meeting a Club Assembly. Under consideration will be dates for the AGM I would ask that everyone start to consider what they will be able to contribute to the running of the Club next Rotary Year. We will also set a date for our Christmas party and discuss the venue. If anyone has a view on the venue please let me know before Thursday. 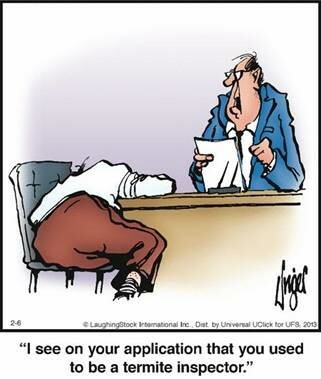 At the Board Meeting we will also consider a request from Wendy Machin. Does anyone know Wendy or the background of this request? ‘I am writing to you in the hope that you will support me in an application to the local Dalmeny Sporting Club. I am seeking some of their funds to pay for a pathway from the bus stop on ort Avenue to the top of Ruth Place; parallel to the Dalmeny Bowling Club. I work with IRT and manage our residents who live independently on the outskirts of the care centre’. NPS teachers Ben Neich & Katrina Close took us back to school. The club toasted District 9600 and its DG Wendy Protheroe. 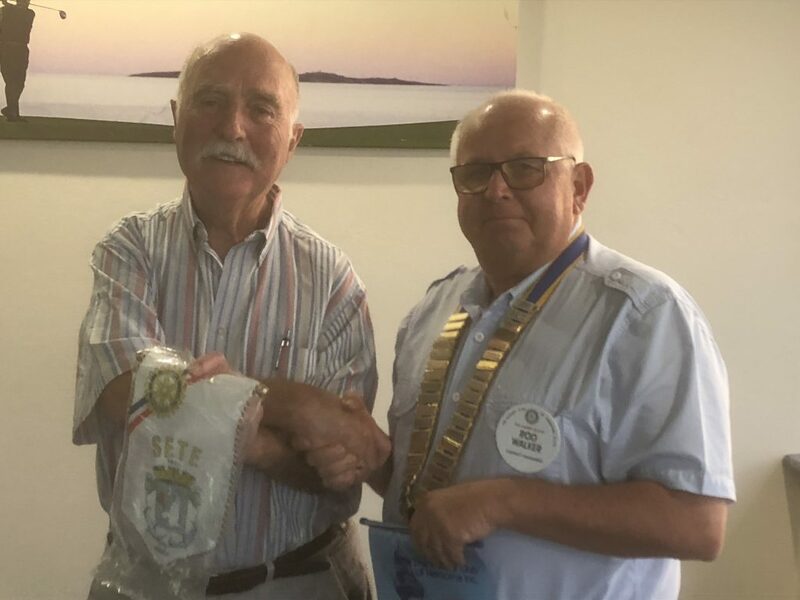 District 9600 is somewhat unique in that it embraces Rotary clubs in four different countries – Australia, Papua New Guinea, Solomon Islands and Nauru. 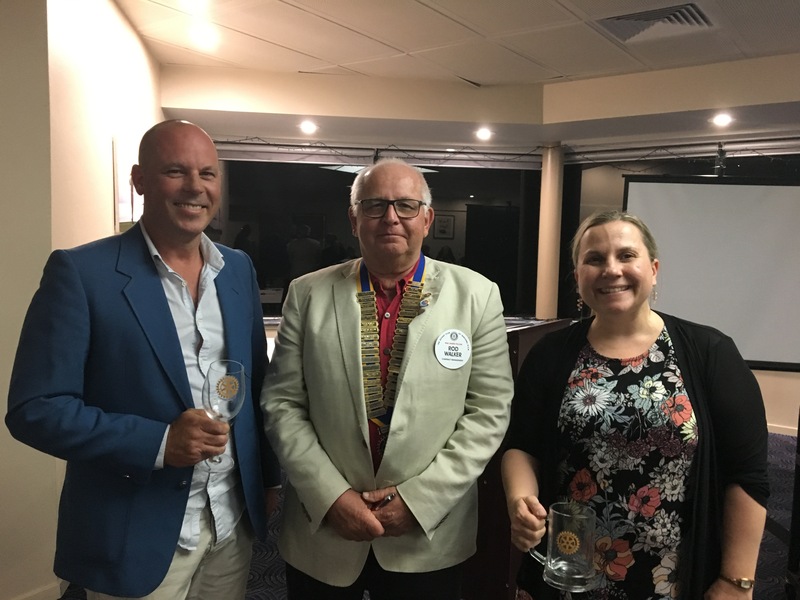 The District extends from Brisbane to Gympie in Queensland, an area that has 49 Rotary Clubs, 13 in PNG, 2 Clubs in the Solomon Islands and 1 Club in Nauru. 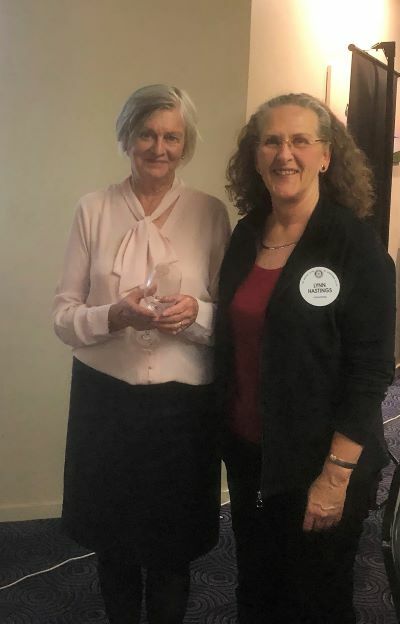 DG Wendy who is a member of the Rotary Club of Brisbane High Rise, has represented Australia and Queensland internationally and was the Queensland Government’s Economic Development Portfolio Director during the 2000 Olympic Games. Wendy was General Manager of Boys Town Counselling Services with responsibilities across Australia. 14 Members were present last week along with 2 Club guests and 3 guests of members. I have been doing my brown rambling this week around the Nation’s Capital. Ran into fellow Sydney High Old Boy ‘Scomo’. He said to say hello, especially to Peter Bull. Apparently Peter’s exploits were still talked about when Scomo was there some 15 years later. 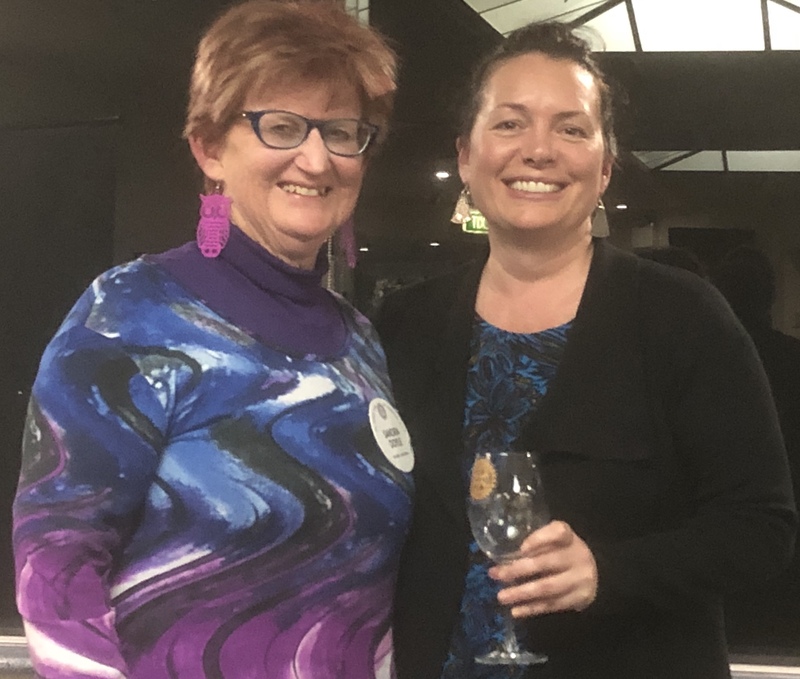 This week we have 2 guest speakers from Narooma Primary School, partners and guests are most welcome to come along to hear Tania’s and Katrina’s engaging presentation. Presentation Title: A Peak into Literacy and Numeracy in 2018. Word sorts, writing fluency, CARS and Stars, five minute frenzies, TENS and Matific – it sounds like a randomly generated collection of strategies we use to build and enhance student knowledge of both literacy and numeracy. Tania will share her knowledge of literacy/numeracy for Kindergarten to Year 3. Katrina will focus on complex skills and understanding developed in our Year 4 to 6 learners. Not sure how the market ended up but it seemed quiet in the van whilst I was there. Over the next 2 months we have some difficult logistics coming up as we don’t have anyone to tow the van, with a number of our regulars not available. Please let me know if you can help out. Hello all, we have cancelled this week’s meeting due to a number of factors converging that meant holding a meeting was no longer practical. Our guest speaker John Griffiths from the Kinema will be rescheduled to a later date. Hopefully we can draw a much bigger crowd for him then. John would have been feeling low anyway after the Wallabies were beaten by the Pumas Saturday night. 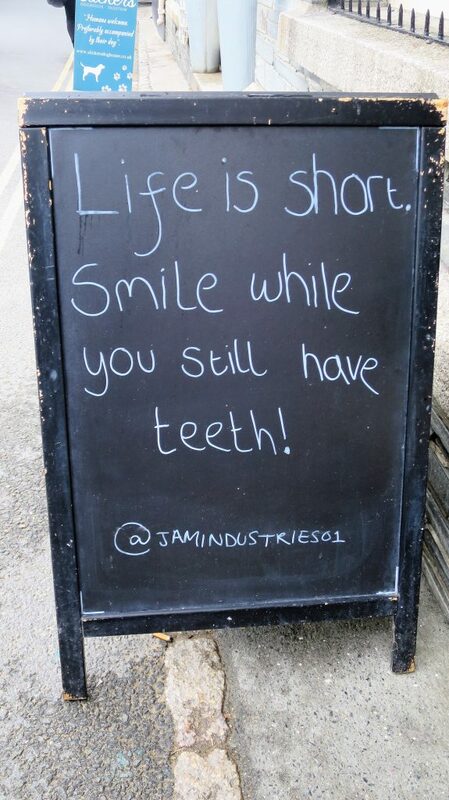 Last week’s meeting whilst the numbers were small a good time was had by all with much laughter and merriment. This will be the last meal from the Golf Club Bistro in its present state with it undergoing major renovations over the next week. The Whale Watching raffle was drawn this week the winner being Crystal Atkins from Batemans Bay. Here is the article I have submitted to the media. 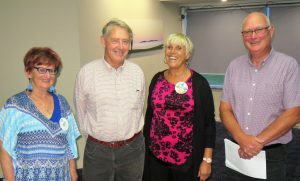 Last Saturday saw the drawing of the Rotary Club of Narooma’s annual Whale Watching raffle donated by Narooma Charters. 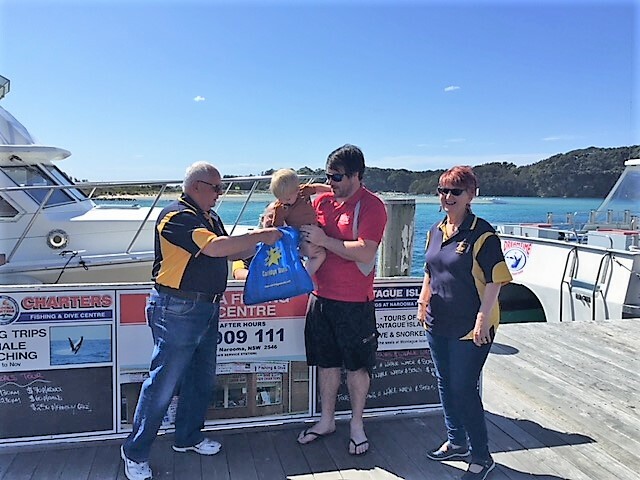 Nick Ingersoll and family were on hand at the Narooma Wharf to draw the winning ticket which belonged to Crystal Atkins of Batemans Bay. Crystal volunteers with the Animal Welfare League and was delighted to be this year’s winner. The whales are already on the way south and pods of up to 10 whales are a common sight on Narooma Charters tours. 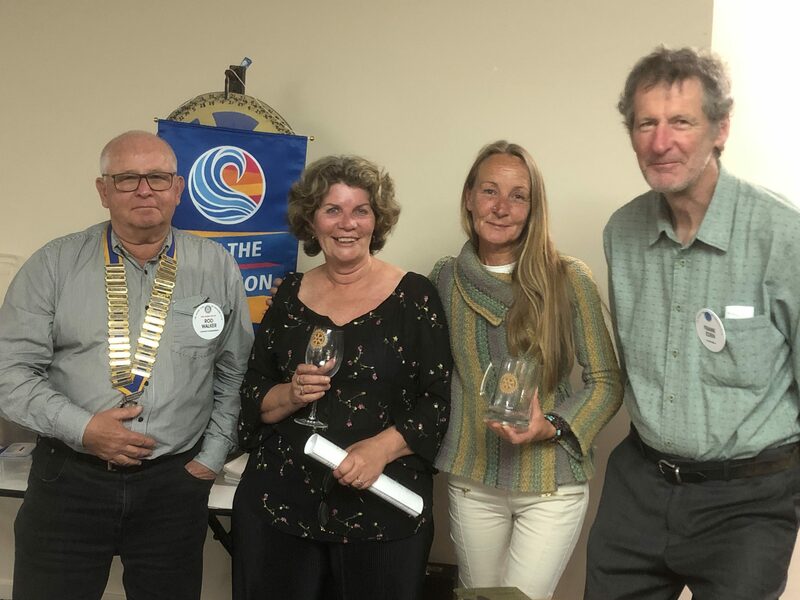 Narooma Charters has been a long-term supporter of Rotary and this year the raffle raised over $1,700 for Rotary’s charity partner Muddy Puddles. Muddy Puddles provides services to children with disabilities that assist them in reaching their full potential. President of the Rotary Club of Narooma, Rod Walker, congratulated Narooma Charters for their continued support and added that the assistance we receive from across the Narooma business community is outstanding and the main reason Rotary can do the work it does. September is Literacy Month and Ange has organised for the 27th September two guest speakers from Narooma Primary School Katrina Cross & Tania Hextell. The title of their presentation is A Peek into Literacy and Numeracy in 2018. It seems that it was all quiet on the front this week with President, Rod and Vice president Laurelle away travelling. It was left to Past President Bob to run the show. Muddy Puddles provides support to children across the early years (0 – 6), primary years and teens and young adults (to 18 years). 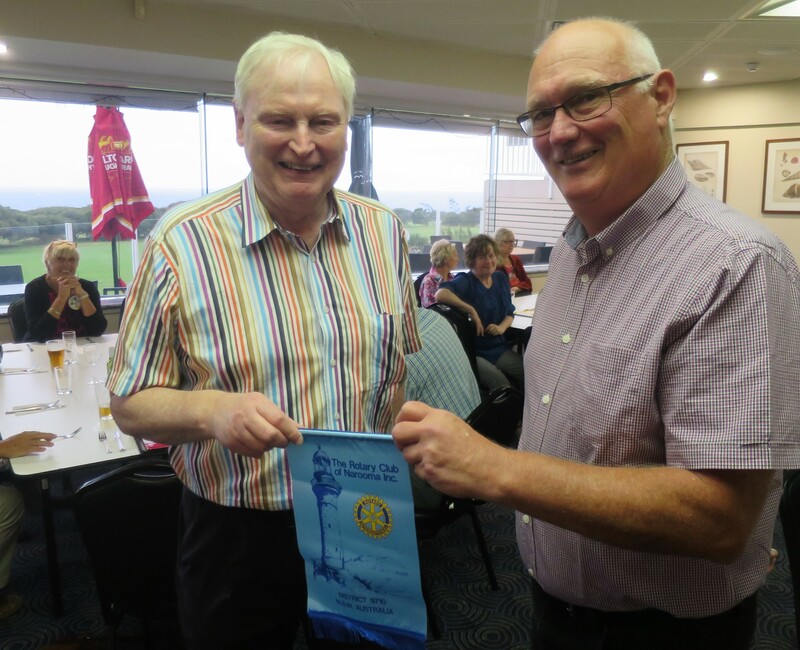 Muddy Puddles will be a very worthy recipient of funds raised at the Eurobodalla Rotary Clubs Christmas Race Day. Please place your donation in the envelope along with the deceased person you want remembered. The church will host an evening of fine dining, super entertainment and gracious hostility. This week’s Ramble comes from Carwoola where we are celebrating my grandson Callum’s 18th birthday. Boy how the time flies. They had 10mm of rain the day we arrived which was very welcome, and it was good to see that there were significant falls in other areas. Already the countryside here has a green tinge. Let’s hope there is more rain on the way in the right places. Our club has made a $1,000 donation through a Rotary RAWCS project set up to help drought effected farmers. It is the same project as that being heavily promoted on Channel 9. The Drought Relief Appeal has been an incredible success. So far $9,487,377 has been raised to support drought-stricken farmers. The donations are being administered by our good friends at Rotary Australia and are being distributed to farmers in need with the help of the National Farmers’ Federation. For more detail on where the funds are going double click here. 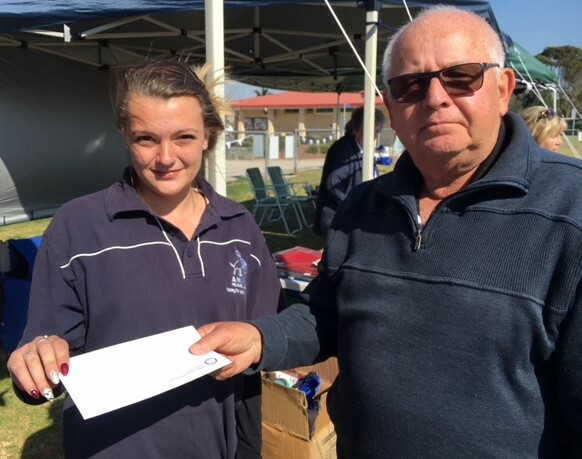 We have sold all the Whale Raffle tickets raising just over $1,700 for Muddy Puddles our charity partner this year for the Moruya Races fundraiser involving Batemans Bay, Moruya and Narooma Rotary Clubs. Thanks to all who sold or bought tickets. I have to single out the efforts of Ange and Michael O’Connor who sold over 50% of the tickets. I am attending a joint meeting next week where I will have more detail on how we can assist on the two race days this year. Our guest speaker this week is the CEO of Muddy Puddles Cate McMath. Laurelle, along with Steve, has jetted off to Europe for a couple months of touring and catching up with friends – we wish them well on their journey. I am filling in for a couple of weeks until Peter Bull returns from Queensland, so if you have an article for the Beacon please let me know. Forgetting that I was the fill in editor last week I forgot to take notes, so I have had to rely on my memory. We were fortunate to have Frank And Iris’ friend, Peter Kasper, with us. Peter gave us a great insight into his life growing up in Austria and travelling to many parts of the world including Australia. He also told us about some of the loves he has had along the way. Peter makes regular trips back to his second home – Australia. Frank tells me he and Iris first met Peter when he joined the Canberra City Band about 20 years ago. He was studying his Masters at ANU at the time. Peter currently works for Pantec, an automation company that writes software to control big industrial machines like printers, weaving machines or robots. He plays clarinet in the Symphonic Wind Orchestra Vorarlberg and does very well at it. You can listen by clicking here (you will need an iTunes account to hear it all). Frank also tells me that he drives a Renau Zoe (Click the link to check it out it is a pretty cool car). Rod also updated us about our links to the virtual world including our webpage, Facebook page and You Tube presence. A reminder that if you are an apology or if you are bringing guests please let me know by 4:00pm Tuesday, preferably by email. If you have not paid your semi annual dues, please do so as soon as possible. just heard on the news that there’s a car going the wrong way on I-25. in a romantic mood and wanted to talk. and settled down to sleep.